Rowan Douglas Williams was born in Swansea, South Wales on 14 June 1950, into a Welsh-speaking family, and was educated at Dynevor Comprehensive School in Swansea and at Christ's College Cambridge where he studied theology. He studied for his doctorate - in the theology of Vladimir Lossky, a leading figure in Russian twentieth-century religious thought - at Wadham College Oxford, taking his DPhil in 1975. After two years as a lecturer at the College of the Resurrection at Mirfield, near Leeds, he was ordained deacon in Ely Cathedral before returning to Cambridge. From 1977, he spent nine years in academic and parish work in Cambridge: first at Westcott House, being ordained priest in 1978, and from 1980 as curate at St George's, Chesterton. In 1983 he was appointed as a Lecturer in Divinity in the University, and the following year became Dean and Chaplain of Clare College. 1986 saw a return to Oxford as Lady Margaret Professor of Divinity and Canon of Christ Church; he was awarded the degree of Doctor of Divinity in 1989, and became a Fellow of the British Academy in 1990. In 1991 Rowan Williams accepted election and consecration as Bishop of Monmouth, a diocese on the Welsh borders, and in 1999 on the retirement of Archbishop Alwyn Rice Jones he was elected Archbishop of Wales, one of the 38 primates of the Anglican Communion. Thus it was that, in July 2002, with eleven years' experience as a diocesan bishop and three as a leading primate in the Communion, Archbishop Williams was confirmed on 2 December 2002 as the 104th bishop of the See of Canterbury: the first Welsh successor to St Augustine of Canterbury and the first since the mid-thirteenth century to be appointed from beyond the English Church. Lord Williams is acknowledged internationally as an outstanding thinker, writer, scholar and teacher. He has been involved in many theological, ecumenical and educational commissions. His more than two dozen books cover a very wide range of related fields - philosophy, theology (especially early and patristic Christianity), spirituality and religious aesthetics: he has published studies of Dostoevsky and C.S. Lewis (a Fellow of Magdalene), and his most recent book, Faith in the Public Square , is a collection of public talks and lectures on the implications of religion for politics and social policy. He is also an accomplished poet and translator. His interests include music, fiction and languages. In 1981 Lord Williams married Jane Paul, a lecturer in theology, whom he met while living and working in Cambridge. They have a daughter and a son. Rowan Williams on reality, suffering, salvation and grace. What does the world need? What does the church Need? RW What Breaks Your Heart? 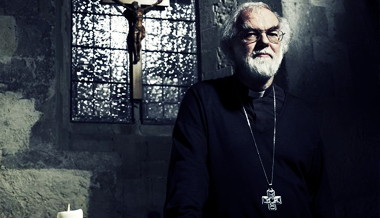 Rowan Williams talks about what breaks his heart.